Icebreaker Wind is a unique wind energy project - the first offshore wind facility in the Great Lakes, the first freshwater wind farm in North America, and only the second offshore wind project in the entire U.S. Very simply, it offers Ohio the opportunity to become a national leader in this nascent industry. Founded in 2009, the Lake Erie Energy Development Corporation (LEEDCo) is a non-profit, public-private partnership, leading efforts to build a sustainable offshore wind energy industry in the Great Lakes. 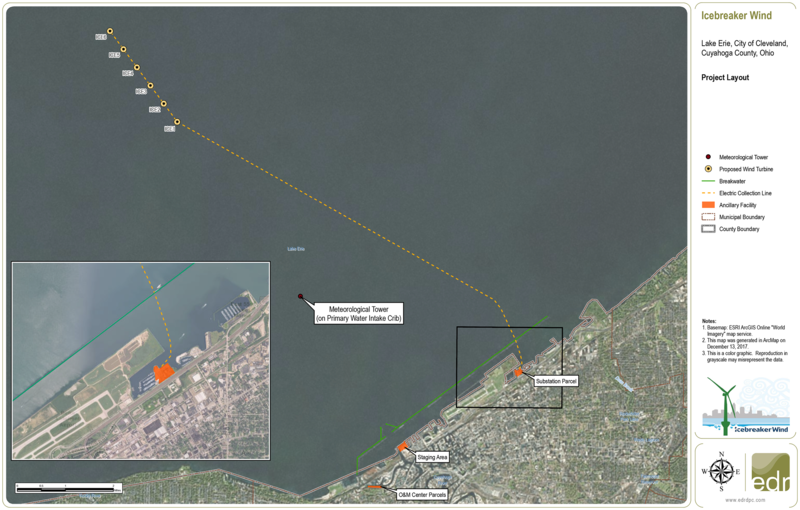 LEEDCo represents Northern Ohio's public interest in offshore wind through its mission to 1) create a scalable source of renewable energy in Lake Erie; 2) create jobs and economic prosperity in the region; and 3) help clean our air and water resources. The vision is a robust offshore wind industry by 2030 that will have significant impact on the economic and environmental state of the region. The first step is the Icebreaker Wind Project, a 20.7 MW demonstration wind farm that will consist of six 3.45 MW turbines located 8 miles north of Cleveland, Ohio. Icebreaker Wind will be the first freshwater offshore wind farm in North America. 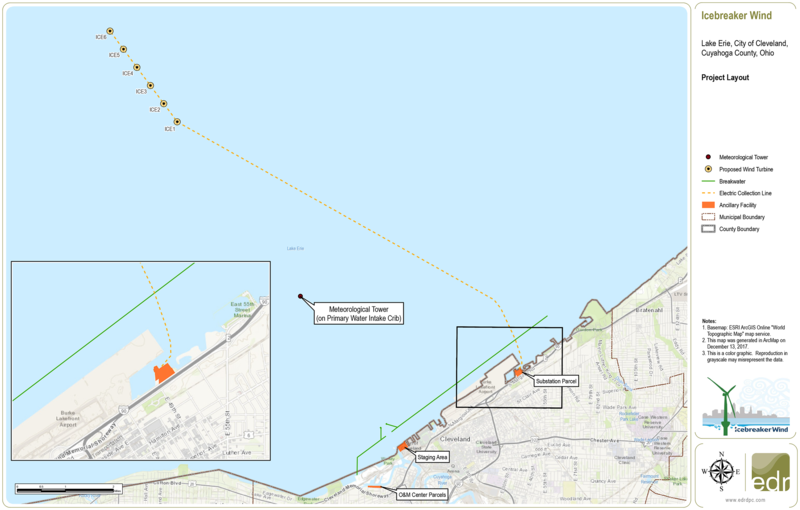 Lake Erie is an ideal location for offshore wind, with ample available interconnect capacity, large load centers along the coast, growing energy demand due to existing plant retirements, a strong manufacturing base, and limited other sources of renewable energy. The Project will use the innovative Mono Bucket (MB) as the turbine foundation, a technology that will reduce both costs and environmental impacts for the offshore wind industry. This game changing technology combines the benefits of a gravity base, a monopile, and a suction bucket. It is perfect for the Great Lakes geology, and avoids the pile driving needed to install traditional monopile and jacket foundations for offshore wind turbines. Pile driving has been shown to produce noise that has been linked to adverse impacts on marine mammals in the Atlantic. LEEDCo succeeded in attracting the attention and the investment of Fred. Olsen Renewables (FOR). Headquartered in Oslo, Norway, FOR develops wind energy projects with a portfolio of over 500 MW installed capacity in the UK and Scandinavia, and 2,200 MW under development. In 2015, FOR formed a new company – Icebreaker Windpower, Inc. (IWP) – based in Cleveland, Ohio, for the purpose of developing, constructing, and operating Icebreaker Wind. Icebreaker Wind will interconnect with the Cleveland Public Power transmission system at the Lake Road 138kV substation. The interconnection study process is complete; rights are secured to participate in the PJM market. The project team includes key organizations located in Northeast Ohio, the U.S., and Europe that bring experience and knowledge critical to working in Lake Erie and the State of Ohio. A Great Wind Resource. The offshore wind energy potential in the Atlantic and Pacific Oceans and in the Great Lakes hold enormous wind energy potential. The Great Lakes hold enough energy potential to power the entire country. The winds of Lake Erie alone could meet over 10% of our electricity needs by 2030. Winds blow stronger and more consistently over water than over land, and better match when energy demands are highest. In addition, offshore wind avoids many of the conflicts posed by land-based wind projects, including: visual impacts, noise, and shadow flicker. Clean Air. Wind power is a clean, abundant and renewable energy source. Icebreaker will reduce air emissions linked to asthma, heart attacks and premature deaths in a region that is known for poor air quality. Wind also produces none of the greenhouse gas emissions causing climate change and the extreme weather events linked to climate change. Unlike nuclear power, wind produces no waste products or risks of tragic accidents. Clean Water. Unlike coal fired power plants, wind power emits no mercury, which is poisoning our waterbodies and the fish and wildlife that depend on them. Wind power also needs no cooling water, so does not release heated water into our lakes and rivers. Icebreaker Wind alone will create over 500 jobs in Northeast Ohio and is projected to have a $168 million local economic impact over the project’s 25 year life. Local labor and manufacturing will be used wherever possible.